Yesterday I shared my time with Benson, who is two. We were out doors where he has a big backyard to play in, a couple of Cocker Spaniels to play with – though he has little time for them as he’s more interested in duplicating his father’s actions. Benson grabbed my hand and led me to the ‘big boys’ shop where the ‘big’ riding lawnmowers and motorcycles are stored. We went inside and quicker than you can blink an eye, he was over, around and through the maze and all but on a mower. I found myself moving quicker than I have in a year or two, and while swooping him up in my arms he had the realization his adventure was brought to a halt. Let me rewind for a moment, since this baby has been barely old enough to be propped in front of his father on the riding lawnmower, Benson has been glued, watching every move. 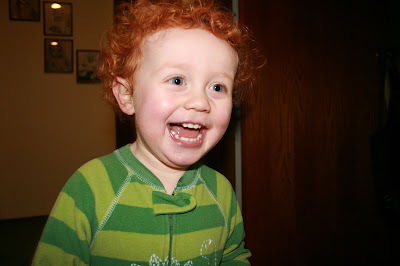 His father taught Benson how to “drive” and “shift” – Who would have known this little masterminded curly-red-head has a photographic memory? I’m guessing he was a little older than a year (not much though) we were out in the backyard, his dad had left the riding lawnmower outdoors with the key in the ignition. Imagining a little guy at that age knowing how to climb up and attempt to turn the key (the only thing that prevented this from occurring was that he didn’t have the strength). Benson would move the wheel back and forth; he attempted to move the lever on the handle bar – he was ready to make that thing go. Thinking to myself, oh my gosh, changes are in the works. His daddy decided it was time to move the lawnmower into the shop – with a closed door. Christmas brought him a John Deer riding lawn mower just like his father’s. Returning to yesterday … after Benson realized that I was interrupting his grand scheme and fussing and flinging about in my arms for a moment, I assured him we’d do something else. We did. He took off headed for his riding lawn mower – I quickly realized that it was operational. It too had a gas pedal (that works), gears including reverse (that work) and the steering wheel that moves when he turns it. He jumped on that thing just like he’s watched his dad a zillion times. Driving it around, he’d get off pick up sticks and add them to the attached bed … and get right back on and continue. I was amused to watch him while he was driving on an uphill slant, occasionally the tires would lose traction preventing him from going anywhere. He’d jump off of it, saying something about it not getting enough gas (remember he’s two), fiddle with the gas lid saying it would get more gas, jump back onto the seat and put it into gear, foot on the pedal with determination and belief that mower would move forward – and it did, with a helping hand unbeknown to him. I love being Benson's grandma. Where might you apply this little guy’s wisdom in your life? © Copyrighted 1998 – 2009 by Glenda Gibbs. Feel free to share... The content may be forwarded in full, with copyright/contact/creation information intact. Glenda is passionate about leaving the world a better place, people feeling better about themselves and the power of positive thinking. She loves to share her wisdom and experiences as an integrative coach/counselor, facilitator and writer. "Where ever you go, there you are"
An anonymous member writes the following post, beyond it I've responded. As a "born-again" Christian at the age of 9......I made many major mistakes throughout my life. Living too long with an abusive husband, NOT attempting to own the things which were rightfully mine, and often not standing up for my rights because I wanted to be a "peacemaker". Which would have been more fulfilling and productive: Following Christianity (as it is mistakenly taught) OR accepting God's gifts? Gifts, including [Law of Attraction] LOA, laughter, love and adventure. Positive things in your life are gifts from God, whatever YOU see God to be. A spirit,a being,far beyond our most intent imagination. I feel some sadness for those who would belittle what God most likely is, by insinuating that God's gifts can be distorted by some other negative and hopefully nonexistent entity. Using our intelligence and positive thinking is acceptance of the gifts we were given at birth. Most likely they could help us to make the world a better place. Isn't it somewhat rude to be ungrateful for them? I'm thinking there are many times in my life where "my not enough stuff" dominated ... when complimented I couldn't accept - because in my mind I wasn't living up to the ascribed teachings of Judeo-Christianity. I wasn’t worthy. Never a clue the gifts (i.e., my creativity, daily behaviors of helping someone or looking nice, or smiling) were an expression of God being manifested. So what does all of this have to do with the original post? I believe there are those who are where I was and they are potential students for those of us who have evolved. Evolving doesn't make me better; it makes me more responsible - responding with ability. I choose to be responsible and share me - how ever that looks. For many of us, our myopic teachings are inclusive of us/them, better/worse, judgment/acceptance and as we evolve these teachings lose their grip individually and collectively. Example, Obama wouldn't have been a president ten years ago - we as a society had more evolving to do. Life is filled with contrast and with this contrast we're able to discern what works in our lives and what doesn't and this occurs as we mature emotionally and spiritually. This thought brings to mind the times when I have heard someone say that "I" came up with the idea, giving the impression they are the mastermind behind the idea, their ego is really bruised when someone else has an similar idea or one that's better ... and there are those who we all know who have a great idea and downplay it, minimize it and or neglect using it. Both perspectives aren't about acknowledging God/Spirit/Source. When I speak or facilitate or anything bringing the attention/compliments to me ... used to be I'd downplay it (thinking I'd be boasting), later realizing how sharing my gifts are an inherent expression of God/Spirit/Source. I really feel good getting to share, experiencing others benefiting from my sharing is so gratifying. I am the tool through which ideas flow forth and this happens when "I" get out of the way and allow. This has probably been shared a thousand times - here's one more - how many things do we take for granted? ... the coffee pot delivering fresh hot coffee, the water faucet delivering water when turned on, the flip of a switch turns the dark to light... the newspaper being delivered ... we take these things and a wealth of others for granted. Without thought they happen. ... and yet, like my friend when something that's out of my comfort zone grabs my attention -- doubt or belief? From being on auto-pilot with my thoughts to paying attention to exactly what I am thinking can be an interesting experience - randomly I'll find myself having a out of sync thought - and I'll say (to myself) where did that thought come from or what's that all about? and for the most part it gets dismissed. Amazing. And then I think of how I used to live life without paying attention to what the 'filler' was or to question the validity of my thoughts and for that matter, to realize my thoughts/beliefs and emotions are of my choosing. Any time we challenge our beliefs we're allowing ourselves to be big and bold.